My first ever Fantasy novel is out! If you’re a fan of epic and military fantasy, if you love the works of Brandon Sanderson, Robert Jordan, George R.R. 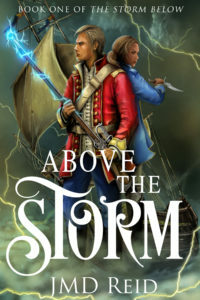 Martin, R. Scott Bakker, and Steven Erikson, then you have to check out my novel Above the Storm! To save the world, Ary must die! Are you ready for the action, danger, romance, and betrayal exploding across the skies Above the Storm! It’s nearing Christmas, and Nyssa and Ellis want to make it something special. Nyssa, orphaned and raised by her thieving uncle, never had a proper Christmas while for Ellis it represented the family he lost in the car accident that left him crippled three years ago. As their relationship grows closer, both want to make the other happy. And this leads to all sorts of tropey relationship drama as Nyssa wants to learn how to dance but keep it a secret. But when Ellis sees her with her dancing instructor, jealousy grows. While it doesn’t descend into horrible fighting, it does add a strain to this story. Out of all five of the Nyssa novellas, this is the weakest to me. For others who are more into the romance, they might really like this. But even still, this story maintains its heart. It doesn’t have the life and death stakes of the other novellas, but it maintains that warmth and hope the others have. It is sweet reading about them trying to make the other have the best Christmas possible, struggling to figure out the perfect gift, and at the end, when they open up to each other, it’s rather beautiful. Nyssa Glass continues to be a great series that fans of fantasy and steampunk of all ages will enjoy. 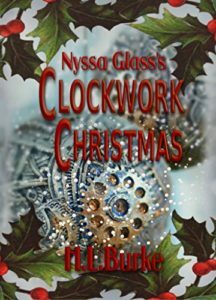 You can buy Nyssa Glass’s Clockwork Christmas from Amazon! Settled into their new life, Nyssa and Ellis have opened their own repair shop. They need this business to be successful as Ellis’s money is dwindling fast. But when they catch a pickpocket trying to steal Ellis’s possessions, Nyssa sees herself in the young boy, something Ellis recognizes. The couple adopts the boy, to give him a new life like Nyssa had from her dead mentor. But the cutpurse entering their life couldn’t have happened at a worse time. Nyssa’s past has caught up. Her uncle, the man who turned her into a thief, appears. Not dead, like his criminal partners had claimed when they tried to use Nyssa, but in prison for the last decade. Thinking Nyssa must have quite the stash, he wants his cut. And he’ll do anything to get it. The theme of identity comes up over and over in these books, from the computer AI in the first novella, to the true identity of the young couple in the last book. Now Nyssa’s true identity as a thief is released to her new community by the man who made her into one. It’s a tense story as you watch all Nyssa and Ellis’s hard work to start over ruined by a greedy man who doesn’t understand the true meaning of family. 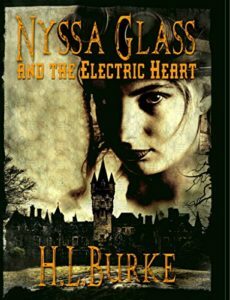 Like the other Nyssa Glass novellas, this one has heart that keeps you reading. Burke has really found magic with the characters of Nyssa and Ellis, and you want them to succeed against the obstacles laid out before them. Another excellent novella. 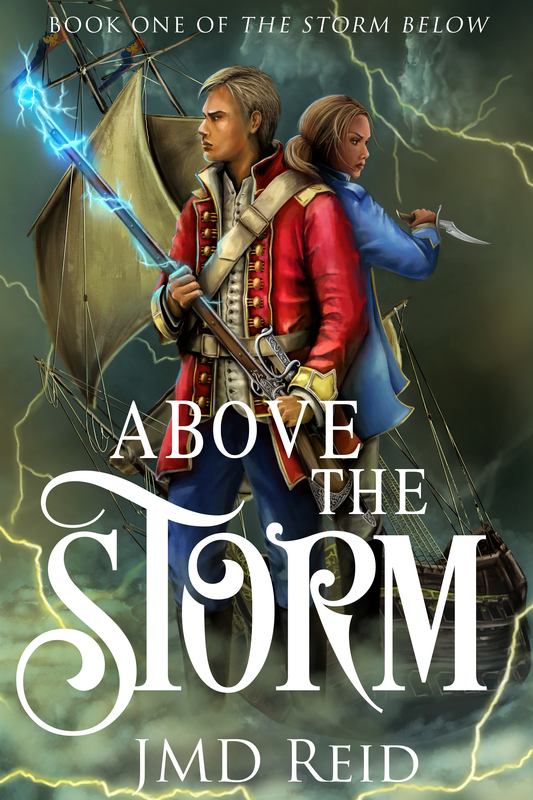 Fans of fantasy and steampunk need to check out this delightful young adult novella. 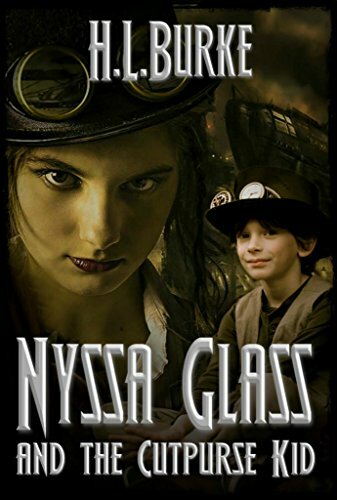 You can buy Nyssa Glass and the Cutpurse Kid from Amazon! Nyssa Glass and Ellis Dallhart are trying to both leave their pasts behind and escape from their country. Nyssa, still wanted for murder, and Ellis stunned by his father’s work, just want a fresh start. The young couple have their opportunity, their new documents, and their tickets on an airship that will take them away from it all. Only for another young couple to rob them and take their new identities. Nyssa and Ellis will have to find a new way to escape the country as they become embroiled in a young couple fleeing the girl’s tyrannical uncle. Will this young Romeo and Juliet prove reliable allies, or will their own misdeeds cost Nyssa and Ellis everything? What a great follow-up to Nyssa Glass and the House of Mirrors. Nyssa and Ellis make a cute couple, still in this awkward stage of their relationship, not sure what they really are to each other. More than friends, but not quite lovers. But they are in it together, dealing with the complication the young couple eloping have caused them. Ellis being in a wheelchair adds another dimension that allows Burke to come up with creative solutions to their problems. The pair compliment each other well. They’re both intelligent, but Ellis’s caution and Nyssa’s daring work well to balance each other and lead them to their success. Another great young adult novella from Burke. Fans of fantasy and steampunk need to check out this delightful series! 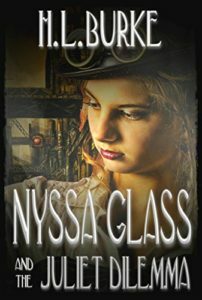 You can buy Nyssa Glass and the Juliet Dilemma from Amazon! 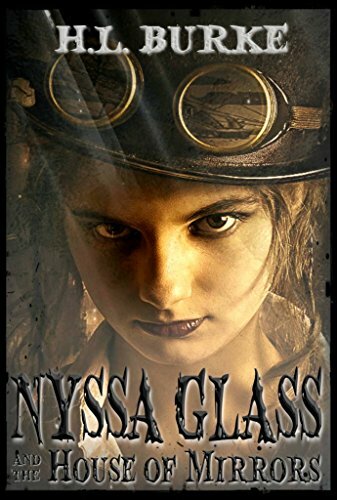 Nyssa Glass is a young woman with a troubled past. Raised as a thief and a pickpocket by an abusive uncle, she found freedom when he died. With the sponsorship of Mr. Calloway, she received an education in engineering and a job in his repair shop. She just wants a peaceful life. But everything changes when her past catches up to her. Someone needs her skills for a dangerous job. When she revuses, she finds herself on the run, framed for Mr. Calloway’s murder, and having no choice but to complete the job to salvage her own reputation. She’ll have to enter the mansion of Mr. Dalhart, famed inventor of many of the steampunk technology of her world. No one has seen Mr. Dalhart, his crippled son Ellis, or the staff in three years. Everyone sent is has died. Nysaa Glass will have to use all her skills to survive. What a wonderful, young adult novella. Burke has created a very realistic steampunk world, blending Victorian England with devices that are almost like modern technology but are so different. Full of heart and warmth, as well as danger. Tackling such topics as identity and what it means to be human, Burke weaves a fast-paced tale that keeps your reading and rooting for her young heroine to uncover the truth of The House of Mirrors. If you’re a fan of fantasy, young adult literature not steeped in vapid romance, or steampunk adventures, this is a story for you! Great for youths and adults. 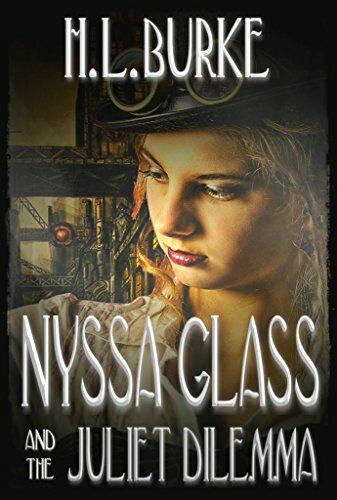 You can buy Nyssa Glass and the House of Mirrors from Amazon!